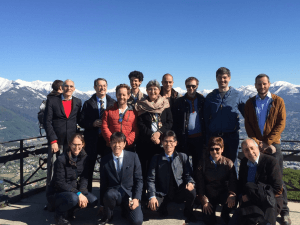 The First European Aquaphotomics Meeting was held in Lugano, Switzerland on April 28-29, 2017. Among the 24 participants we had scientists from Italy, Hungary, Serbia, Austria, Netherlands, Denmark and Switzerland, with guests from the United States and Japan. The aim of the meeting was to bring together scientists from multiple disciplines related to water science in order to discuss future perspectives of aquaphotomics research from different points of view. This meeting was supported by the Tsuki no Shizuku Foundation. The establishment of this Foundation was announced with a letter of Mr. T. Hama, who explained the aim of the Tsuki no Shizuku Foundation to support aquaphotomics research and share results for a better world. This message was well received by the audience.